“Point the finger, and we have three pointing back at us!” This little phrase is responsible for countless ah-ha moments. Whether we’ve heard the phrase or not, when someone says it to us, it’s almost as if we can see the mirror at the end of our pointed finger. Actually, if we picture a mirror when our minds or our mouths are running about this one or that one, it can stop us short. Hopefully, we recognize what’s really bothering us about ourselves, in time before our judgments or criticisms hurt someone. Always ask “what’s really, really bothering me?” Certainly it’s not that he/she ate the last pretzel. Believing In Myself, by Earnie Larsen & Carol Hegarty, p. March 7. Simon & Schuster, NY 1991. 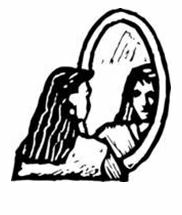 This entry was posted in Celestial Psychology and tagged Believing In Myself: Self Esteem Daily Meditations, Carl Jung, Irritation, Self-Reflection. Bookmark the permalink.